The youth sector sees the education system as commercialized, colonialized and fascist even during an administration that claims the re-institutionalization of democracy pertaining to President Benigno Simeon Cojuangco- Aquino III. “Aquino should forever remember that lessening the budget in education, harassment of student leaders and misleading the national budget to dirty deeds like the P10B pork barrel scam will only keep the youths and students more critical of the national situation,” Panlasigui added. Moreover, Panlasigui together with the NUSP codemned the tuition fee increases allowed by the Commission on Higher Education (CHED) and Department of Education (DepEd) for numerous basic and higher private schools for the School Year 2014-2015. He then stressed that this will only bring additional burden to parents and will also not be used to raise teachers’ wages. Panlasigui also said that low state subsidy and high tuition rate are not the only violation of the rights of the students and the youth. He emphasized that within the schools, policies like No Permit, No Exam deprives the youth for quality and accessible education. 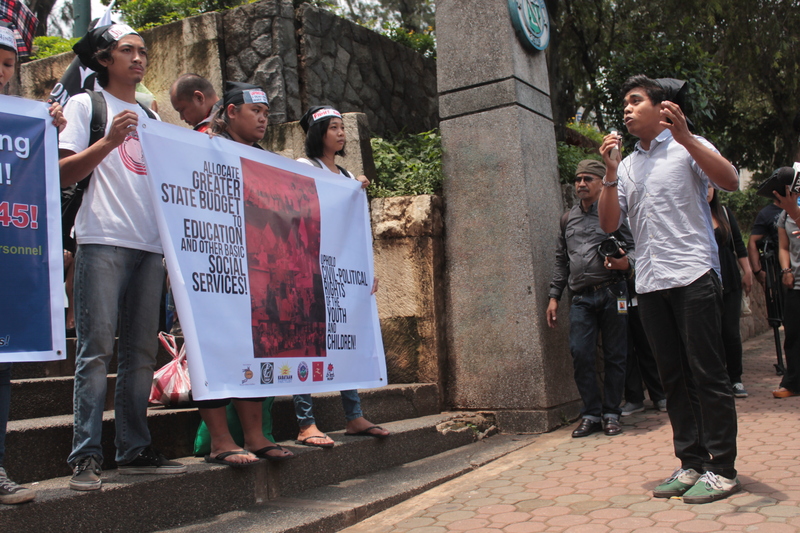 Furthermore, Panlasigui added that the violation of students’ democratic rights still continue insode the campuses. He said that the Reserve Officers Training Corps (ROTC) program only promotes fascist and feudal culture to the students and only results to violence. ROTC is also known to serve as an intellegence network to conduct surveilance and harrassment against progressive student leaders. He also cited an incident of red-tagging in Saint Louis University wherein the council members and student leaders were labeled as recruiters of the New Peoples Army (NPA) during the National Service Training Program (NSTP). He added that as the quality of education is sacrificed, the literacy rate and the brain drain in the country is not yet resolved, yet it is getting worse. “The multi-faceted characteristic of education that serves the interest of the bourgeoisie and bureaucrats, the youths are left no choice,” Panlasigui ended.